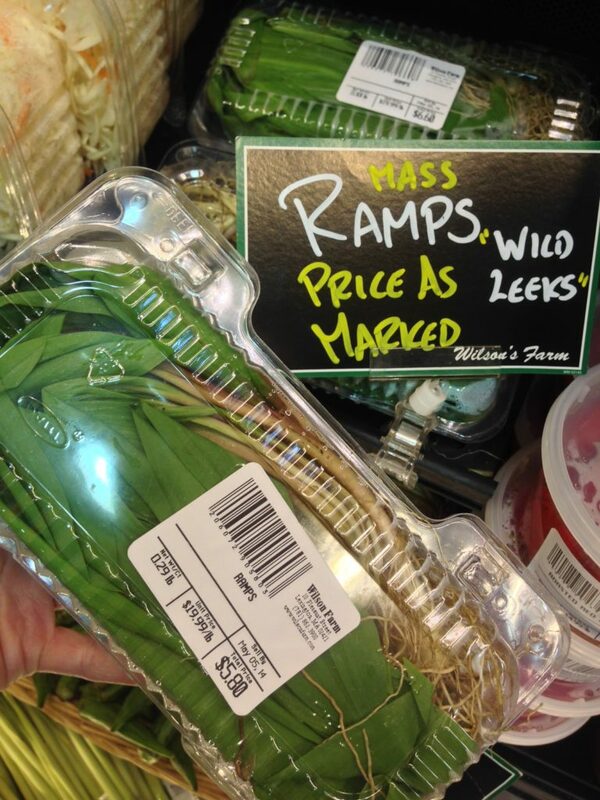 Wilson Farm ramps, photo courtesy Sista Felicia at GoodMorningGloucester. I’ve been experimenting with ramps lately. For those initiated, ramps are a wild allium (leek/garlic type vegetable) with an unforgettably sharp flavor and aroma. They aren’t cultivated so only appear for a few weeks in the sprint, and this year I noticed that our local farm stand was carrying them (picture above shamelessly ganked from someone’s blog). So I started looking for things to do with them, and so far my impression is the simpler the better. I started with a variation on this spring green risotto from the New York Times. I didn’t have any spring greens so I substituted some fresh English peas. It was… just OK. The flavor was subdued and, while tasty, the risotto didn’t capture the excitement of the ingredient. On Sunday I went much, much simpler, tossing ramps (and some bok choy) in olive oil and grilling it over low heat in a basket until I started to get black edges on the greens. This was much, much better — the bulb of the ramp was sweet and the green was smoky with a little bite. But the best recipe of all may be the family recipe that my uncle makes: fry some streaky lean bacon, fry potatoes in the bacon fat, then add the ramps at the end. Looking forward to trying this weekend if any ramps are left at the stand.